Two of the best things about spring in Texas: it’s warm enough for ice cream and wildflowers. The Bluebonnets are out despite the ridiculous drought. And if you can find a patch of flowers that’s bigger than a square foot near town, you can bet you’ll find a family making a beeline for the ‘bonnets with a camera in hand. Growing up, my mom would bust out a can of Eagle Condensed milk and our old school ice-and-rock-salt ice cream maker. 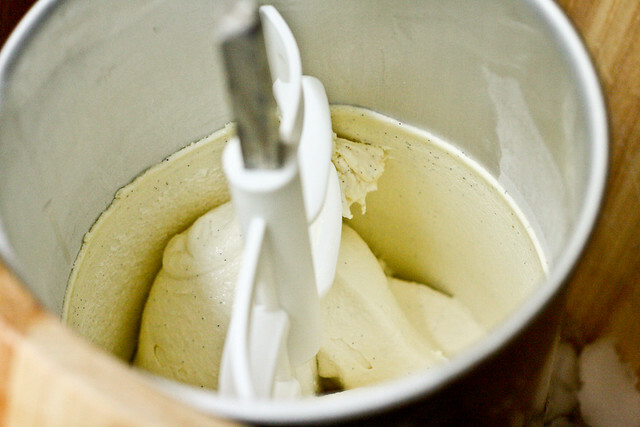 The ice cream maker would sit in the sink and painfully – loudly – grind and churn away at the vanilla goodie inside. Other times of the year, we just headed to the grocery store to pick up some Blue Bell. Blue Bell’s Homemade Vanilla, while plain as it may sound, has been my favorite ice cream for 30 years. It has that condensed milk-taste that reminds me of mom’s ice cream – without the hour of whining from an incredibly old and overworked ice cream maker motor. You know what else has that taste? 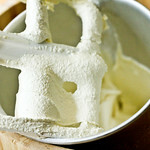 French-style, homemade vanilla ice cream. I’m determined to freeze, churn, and cook my way through The Perfect Scoop this year. We love the White Chocolate ice cream, in both it’s regular and souped-up versions. And the chocolate? Stay tuned… trust me, it’s totally worth the wait. 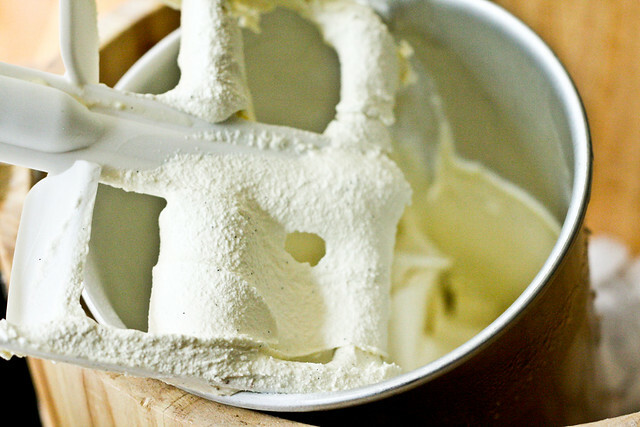 A smooth, rich homemade vanilla ice cream studded with flecks of vanilla bean. Warm the milk, sugar, 1 cup of cream, and salt in a medium sauce pan. Scrape the seeds from the vanilla bean into the pan, add the pods, and turn off the heat. Let steep for 30 minutes. Pour the remaining cream into a large bowl and set a mesh strainer on top. In a separate bowl, whisk the egg yolks. Slowly add the warmed milk to the yolks and then add the yolk mixture to the sauce pan. Stir the mixture constantly over medium heat, scraping the bottom as you stir, until the mixture thickens and coats the spatula. Pour the custard through the strainer and stir it into the cream. Add the vanilla extract and stir until cool over an ice bath. Chill the mixture thoroughly in the fridge and then freeze in your ice cream maker, according to manufacturer's instructions. The bluebonnets sound gorgeous!! It’s been raining a lot here, which is good for the flowers of course, haha – but no bluebonnets!! ICE CREAM!!! Classic. Used to love the Blue Bell brand. I’ve already shot pics of my baby in bluebonnets! Ahhhh, Blue Bell-it is the best ice cream in the country. 😉 I love the Vanilla Bean Flavor they offer. But can’t wait to try your recipe. What can top homemade ice cream?!? That looks soooo good! I was planning on making this tomorrow! My in-laws are coming to visit, and I wanted to make this for my father-in-law, who is a vanilla ice cream fanatic. I made the chocolate ice cream not too long ago, and it is fabulous! I’m amazed at the wonderful recipes from this book. What kind of ice cream maker do you use? It looks like a nice one in the pictures. I love Blue Bell, especially Vanilla! The ice cream you created looks awesome!!! I love the first pic! However, Vanilla beans ain’t cheap, if you subbed with extract only, any guesses on the amount? I buy them on Amazon – SO much more affordable than the jar of 2-3 beans in the store. You absolutely can use vanilla extract, I use a full Tbsp. I just stumbled onto this recipe and just made it. It’s absoluTely fabulous!!! My house smells like vanilla. Mmmmm:) I should’ve made more. I LOVE YOUR RECIPES!!! Your strawberry cake has made me famous at birthdays lol! Will it mess up the proportions to add fruit to the mix? Or would some kind of berry ice cream need a whole different recipe? It’s doable. It might depend on the fruit and how you’re adding it (the smaller, the better) but I’ve mixed in ~a cup of thawed/chilled strawberry puree before with excellent results. Thanks so much!! That’s what I had in mind!